As regular readers know, the BBC’s English language services did not report any of the fourteen separate incidents of missile attacks by terrorist groups located either in the Gaza Strip or the Sinai Peninsula that took place between January and November 2017. Multiple mortar attacks on an IDF position that were launched from the Gaza Strip by the Palestinian Islamic Jihad on November 30th were mentioned in a BBC report on another topic. On December 7th three missiles were launched from the Gaza Strip. “Two rockets fired from the Gaza Strip fell inside the Hamas-controlled Gaza Strip and did not reach Israeli territory, but set off rocket sirens in the Hof Ashkelon and Sha’ar HaNegev regional councils, as well as the city of Sdreot. 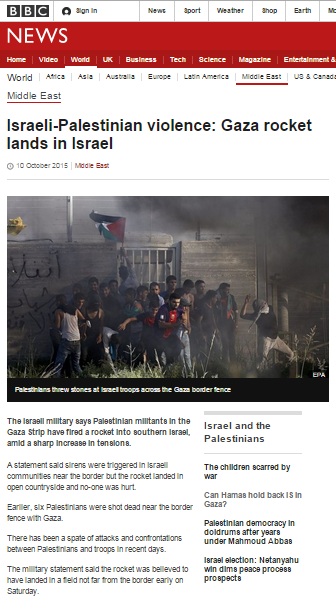 Israel later responded to those attacks – which were not reported by the BBC. On the evening of December 8th three more attacks took place. One projectile was intercepted by the Iron Dome missile defence system, one – initially thought to have fallen short – was later located in the Sdot Negev district and one hit the town of Sderot. The following day an additional rocket was discovered in the yard of a kindergarten in Sderot which was fortunately empty at the time. Israel responded to those attacks with strikes on Hamas facilities in the Gaza Strip in which two members of Hamas’ Izz a din al Qassam brigades were killed. “Israel says it has targeted sites in Gaza belonging to militant group Hamas in retaliation for rocket strikes. Israel’s military said it hit weapons sites early on Saturday. Two people were killed, a Gaza hospital said, bringing the deaths in Israeli strikes and gunfire over the past day to four. 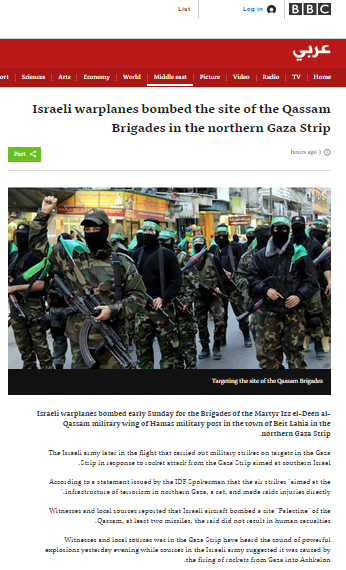 The report did not clarify that the two people killed were Hamas operatives and readers saw no reporting from the town of Sderot other than the statement “[n]o casualties were reported” that appeared later in the article. 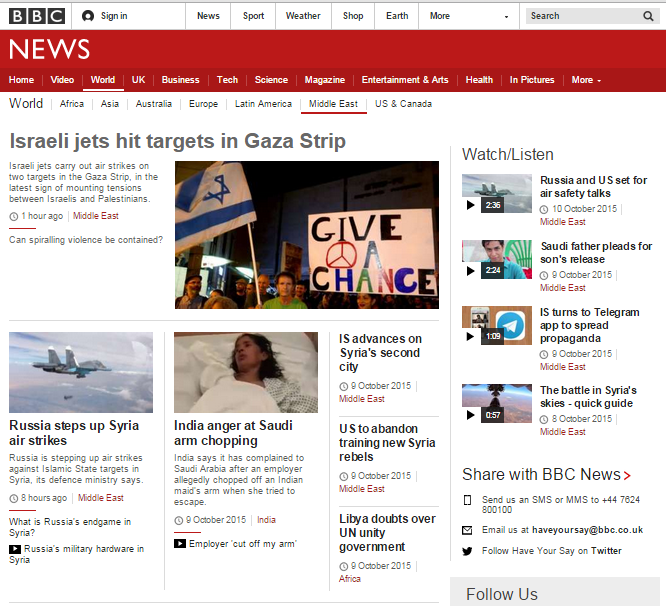 Visitors to the BBC Arabic website also found a report on the Israeli response to Friday’s missile attacks. Given that the BBC’s English language services elected to completely ignore numerous separate incidents of missile attacks from the Gaza Strip earlier in the year, the question that inevitably arises is why the attacks on December 8th were treated differently. It is of course difficult to avoid the conclusion that the novel display of BBC interest in this particular round of attacks from Gaza is linked to the fact that it can be framed as being connected to – or indeed ‘fallout’ from – the US president’s announcement concerning Jerusalem. The fact that the BBC refrained from informing its English-speaking audiences of all previous attacks this year obviously reinforces that erroneous narrative. At around 9 p.m. on the evening of August 8th residents of Ashkelon and the Hof Ashkelon district in the western Negev had to scramble for cover as sirens warned of an incoming missile fired from the Gaza Strip. “The army said the projectile struck an open area in the Hof Ashkelon Regional Council. Several hours later Israel responded with strikes on two Hamas posts in the Gaza Strip. Despite at least one employee at the BBC’s Gaza office being aware of those events, the attack did not receive any coverage. Since the beginning of 2017 thirteen separate incidents of missile fire from either the Gaza Strip or the Sinai Peninsula have taken place. The BBC’s English language services have not informed audiences of any of those attacks. The pattern of reporting whereby the vast majority of missile attacks from the Gaza Strip are not covered in the English language but Israel’s response to those attacks is sometimes reported in Arabic has been in evidence since the end of the summer 2014 conflict between Israel and Hamas. Throughout 2016 just one of the ten attacks that took place received BBC coverage in the English language. On the morning of March 18th residents of the western Negev region once again came under missile attack, just days after a previous incident. “Rocket sirens broke the Sabbath calm and sent residents throughout the Gaza periphery scrambling Saturday morning, as two projectiles were launched from the Strip. One rocket exploded near the city of Ashkelon, north of Gaza, causing no casualties or damage. The second apparently fell inside Palestinian territory. Yet again the BBC chose not to report the attack. Since the beginning of the year seven missile attacks against Israel have taken place – five from Gaza and two from Sinai – none of which have been reported by the BBC’s English language services. Israel’s response to three of the attacks launched from the Gaza Strip has however been the subject of coverage on the corporation’s Arabic language website. The pattern of reporting whereby the majority of missile attacks from the Gaza Strip are not covered in the English language but Israel’s response to those attacks is reported in Arabic has been in evidence since the end of the summer 2014 conflict. Throughout 2016 just one of ten attacks received BBC coverage in the English language. On the morning of February 6th sirens sent residents of the Hof Ashkelon district in the western Negev running for cover as a missile fired from the Gaza Strip hit Israeli territory south of Ashkelon. Israel responded with strikes on Hamas installations in the Gaza Strip and the missile fire was later claimed by a Salafist group. Later in the day shots were fired at Israeli troops working on the fence in another area along the border with the Gaza Strip. While the BBC did not produce any coverage of that missile fire in the English language, the BBC Arabic website did publish an article reporting the Israeli response. Throughout the whole of 2016, only one of the ten barrages of missile attacks from the Gaza Strip which took place received (belated) English language coverage, while reporting in Arabic on Israeli responses to those attacks was seen in the majority of cases. The pattern of reporting whereby missile attacks from the Gaza Strip are not covered in the English language but Israel’s response to those attacks is reported in Arabic has been predominant since the end of the summer 2014 conflict and – as we now see – continues into 2017. As regular readers know, the BBC’s coverage of the missile attacks launched from the Gaza Strip at civilian population centres in Israel since the end of the summer 2014 conflict has been – to put it kindly – patchy. Throughout September 2015 there were three separate incidents of missile fire, none of which were the subject of any stand-alone reporting by BBC News. 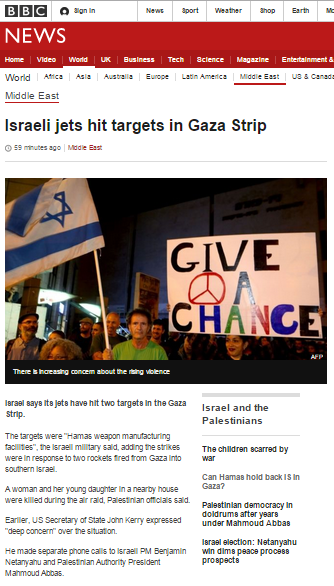 September 18th 2015 – missile fire on Sderot and Ashkelon got 19 words of reporting in a BBC News article on a different topic. The Israeli response was reported by BBC Arabic. September 21st 2015 – missile fire at the Hof Ashkelon area was not reported by BBC News. September 29th 2015 – missile fire at Ashdod got 15 words of coverage in an article on another topic which were later removed when the report was updated. Israel’s response to the attack was covered by BBC Arabic. On the evening of October 4th a missile exploded in the Eshkol region and some hours later Israel responded with a strike on Hamas infrastructure. There was no BBC reporting of that incident. The Eshkol region came under attack again on the night of October 9th/10th and the missile fire was later claimed by a Salafist group in the Gaza Strip. That attack was reported in an article titled “Israeli-Palestinian violence: Gaza rocket lands in Israel” which appeared on the BBC News website’s Middle East page on October 10th. 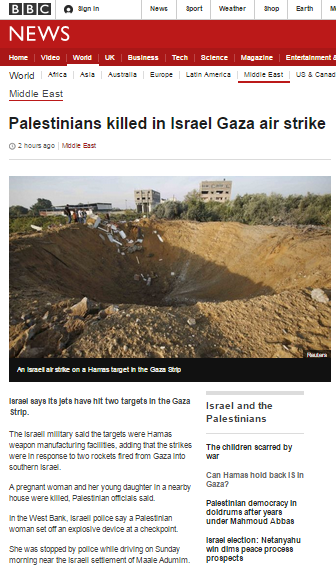 With this being the first BBC News headline describing a missile attack from the Gaza Strip since September 2014, one cannot but conclude that its appearance is linked to augmented BBC reporting on the current wave of terror attacks which, despite its headline, are the subject matter of the bulk of that report. Less than 24 hours later – late on the evening of October 10th – another missile was launched at the Hof Ashkelon area but was successfully intercepted by the Iron Dome missile defence system. The Israeli airforce later responded with strikes on Hamas weapons manufacturing sites in the northern Gaza Strip and Palestinian officials announced that two people had been killed when an explosion at one of the targeted sites caused a nearby home to collapse. The BBC headlines did not take long to appear. BBC Arabic promoted its report on the incident at the head of its main webpage on the morning of October 11th with a headline devoid of any reference to what preceded the Israeli response. On the website’s ‘World’ page, the same statement appeared with a different and equally context-free headline – “Israeli jets hit targets in Gaza Strip”. The same headline and strapline featured prominently on the Middle East page. 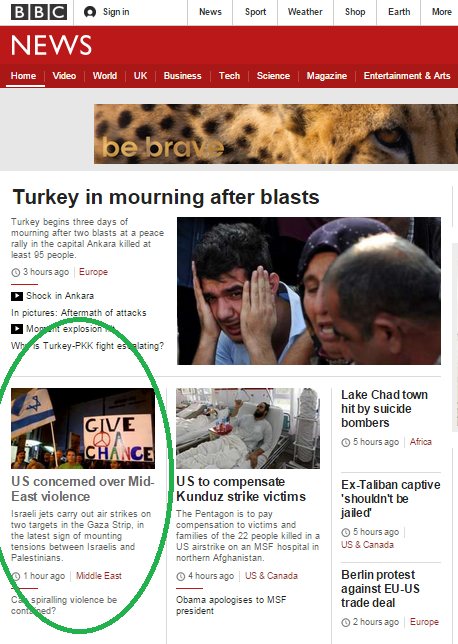 The BBC News report appearing on all those pages of the website was originally titled “Israeli-Palestinian violence: US expresses concern” and in that initial report (and all later versions) the BBC once again promoted uncritical amplification of a trope which forms the foundation for much of the Palestinian incitement fueling the latest wave of terrorism. “There have been weeks of tension over access to a site in East Jerusalem sacred to both Jews and Muslims. 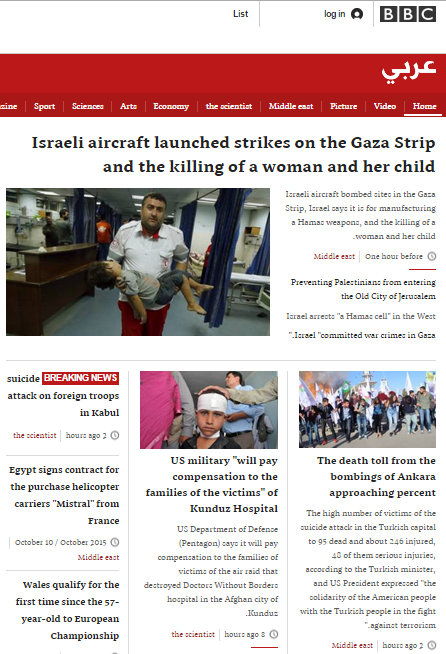 Some four hours after publication, the article’s headline was changed to read “Israeli jets hit targets in Gaza Strip” and the report opened in typical ‘last-first reporting’ style, with no mention of the people affected by the events laconically described as “rockets fired from Gaza into southern Israel”. “Israel says its jets have hit two targets in the Gaza Strip. The targets were “Hamas weapon manufacturing facilities”, the Israeli military said, adding the strikes were in response to two rockets fired from Gaza into southern Israel. Readers would obviously conclude from that portrayal that the woman and child were killed by the Israeli strike. The fourth round of amendments to the report saw a new headline – “Israeli jets hit targets in Gaza Strip, killing a mother and child” – with the BBC backtracking from its previous assertion that the casualties “were killed during the air raid” but showing no interest in clarifying why a Hamas weapons manufacturing facility was located in a residential area. 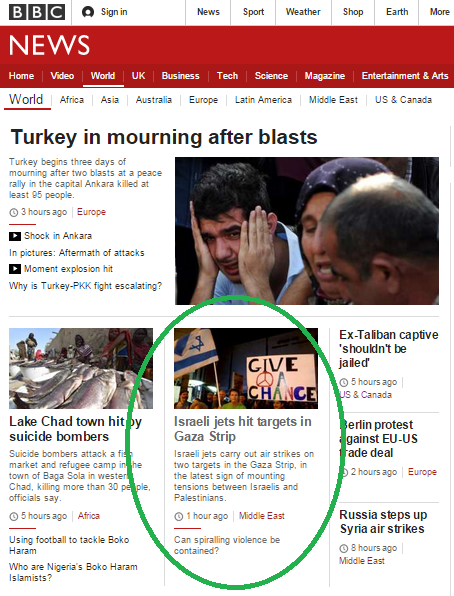 Around an hour later, the headline was changed yet again to read “Palestinians killed in Israel Gaza air strike“. “The violence has spurred talk from Hamas, which dominates Gaza, of a new Palestinian intifada, or uprising. Yet again, however, the BBC fails to provide its audiences with any information about the incitement from unofficial and official Palestinian sources which underpins the current wave of terrorism and the very relevant subject of Hamas’ efforts to boost its terror infrastructure in Judea & Samaria over recent months – which the BBC has failed to report at all – does not get a mention in this report. For the third time in less than two weeks, missile attacks from the Gaza Strip aimed at Israeli civilians were not reported on the BBC’s English language website but the Israeli response to those terror attacks was covered on the corporation’s Arabic language site. At around 9:30 p.m. on June 6th residents in the Ashkelon and Hof Ashkelon areas of southern Israel had to run for cover as air-raid sirens sounded a warning of incoming missile fire from the Gaza Strip. One projectile landed in a field in the Hof Ashkelon area, fortunately causing no injuries. Overnight Israel responded with strikes on terror infrastructure in the northern Gaza Strip’s Bet Lahia region and it was announced that the Kerem Shalom and Erez crossings would not be opened on June 7th. In addition to the Iron Dome missile defence batteries already deployed two days earlier in southern Israel due to the recent rise in missile fire, a further unit was deployed near Rehovot. As was the case after the previous attack three days earlier, the missile fire was claimed by a Salafist group in the Gaza Strip and Channel 10’s Hezi Simantov reported that a senior figure in the group told the paper ‘Al Quds’ that such attacks against Israel would continue as long as Hamas continues to hold members of the group under arrest and to ‘persecute’ Salafists in the Gaza Strip. Whilst the BBC has made a habit of concealing the fact, last summer’s fifty-day conflict between Hamas and Israel also began with attacks by other, smaller, terrorist groups and Hamas’ decision to join in the missile fire was prompted by issues by no means exclusively related to Israel, such as the PA’s refusal to pay the salaries of Hamas employees and the closure of the Rafah border crossing by Egypt. One might therefore have thought that the BBC would have shown some interest in reporting a second missile attack in three days – and the third in less than two weeks – not only because of the inevitable resulting rise in tensions between Israel and the Gaza Strip, but also (especially considering that only two months ago it enthusiastically promoted Khaled Masha’al’s claim that “There is no Daesh [ISIS], no IS or Al Qaeda in Palestine. There are some lone wolves but they are isolated. We don’t allow such thoughts in Palestine”) from the angle of the infighting within the Gaza Strip and Hamas’ failure to prevent other factions from breaching the ceasefire. However, the BBC’s English language website once again carried no coverage whatsoever of this latest attack. 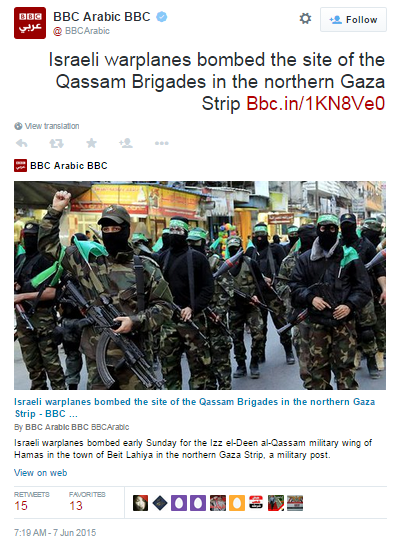 On the other hand, the 1.7 million followers of the BBC Arabic Twitter account were told that “Israeli warplanes bombed the site of the Qassam Brigades in the northern Gaza Strip”. Visitors to the BBC Arabic website found the same context-free headline in an article which once again leads with the effect rather than the cause. As we see, a pattern has been established with regard to the reporting of missile fire from the Gaza Strip. Whilst audiences using the BBC’s English language website are not told of the attacks at all, readers of the BBC Arabic website get to hear first and foremost about the Israeli responses to such attacks. However one wishes to describe this ongoing editorial policy, the appropriate title is certainly not accurate and impartial journalism.